A local mom whose daughter was diagnosed with a rare disease is now warning other parents to be on the lookout if their kids have the same symptoms. Cynthia Donalson said it took them almost 9 months to find out their daughter was diagnosed with Lyme disease. Donalson said for almost a year her daughter Anna who’s now 14 has been fighting to live a normal and healthier life. “She had suffered off and on with stomach issues. She went from being 117 pounds to 104 pounds,” Donalson. She said it started last March and that’s when they started to seek medical attention. “She saw a gastroenterologist at Wolfson‘s had several trips to the emergency room. They tried everything and could not find anything,” Donalson said. She said by the end of the summer she was 85 pounds. Last December a doctor diagnosed Anna with Lyme disease. The disease is caused by bacteria and is transmitted through a bite from an animal or insect. “It was horrible to watch because she was basically disintegrating in front of me,” Donalson said. Anna said it’s unclear where she got Lyme disease but she spent a lot of time at soccer fields diving in dirt and she believes she could have been bitten unknowingly. Dr. Aylin Ozdemir, who is a pediatric integrative medicine doctor diagnosed Anna. Ozdemir said Lyme disease can often be difficult to diagnose. “In many cases patients don’t even remember a tick bite so then they become patients with a myriad of symptoms, then somebody needs to connect the dots. Even the Centers for Disease Control and Infectious Disease Society of America confirms that we don’t have a good sterile-logical blood marker to diagnose Lyme disease and they fall short,” Ozdemir said. The disease is curable and Donalson is warning other parents whose kids may have similar symptoms not to give up until they find a solution. “Pursue, don’t give up, keep looking for help,” Donalson said. Lyme IS NOT RARE! It is twice as common as breast cancer and six times more common than HIV/AIDS. https://www.lymedisease.org/mylymedata-lyme-disease-prevalence/. When the CDC reports numbers they are “only talking about INCIDENCE of Lyme disease — the number of new cases each year. 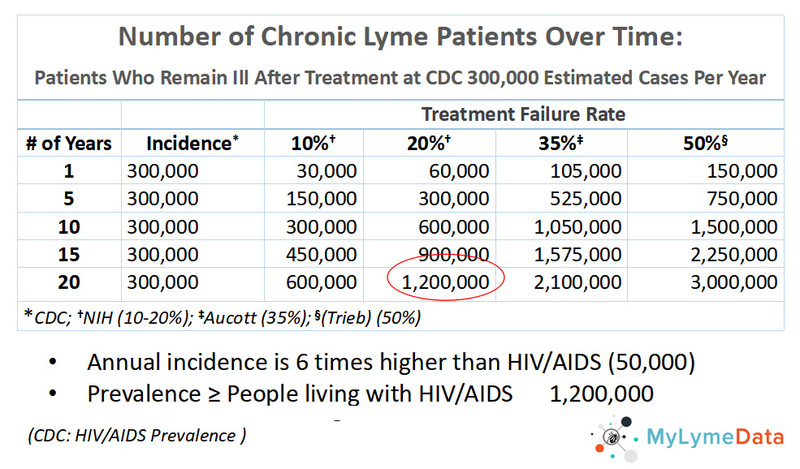 What about prevalence of Lyme disease — the number of people who remain ill over time? The chart below shows Lyme disease prevalence based on the annual incidence of the disease using different assumptions about treatment failure rates. Patients diagnosed and treated early generally respond well to treatment. However, treatment failures ranging from 10-35% have been reported in early disease and higher rates are reported for late disease.” https://www.lymedisease.org/mylymedata-lyme-disease-prevalence/. I had to flip back to the date of this article just to make sure my eyes read that this was written this month and in the year 2019. Wow! is all I can say….